Shred Xtreme Review | Buy or a Scam? Page updated Jan 23, 2019. First published Jan 23, 2019. Two of the most popular ingredients in weight loss and appetite supplements are garcinia cambogia and raspberry ketones. The Innovative Labs Shred Xtreme is another ‘weight management’ supplement containing these and a range of other ingredients, promising to help you lose weight quickly. Here, we look at the Innovative Labs Shred Xtreme in closer detail to see whether it actually works and even more importantly, whether it is safe. Have a read to find out what we thought of it. Innovative Labs Shred Xtreme is a weight management supplement by Innovative Labs. It is a supplement in capsule form which is designed to help you to lose weight and keep it off. It uses popular weight loss ingredients such as green coffee beans, raspberry ketones, and garcinia cambogia, but it is unclear as to how much of each ingredient the supplement has in it is unknown. Instead, the manufacturer has decided to list the quantities under a proprietary blend called ‘Eco Garcinia Daily Blend’. The user is required to take two capsules a day. Whilst caffeine anhydrous is not listed as an ingredient on the bottle label image, it is referred to in the Amazon description. What Are The Side Effects Of Shred Xtreme? Some of the ingredients contained in this supplement may have some side effects. Please see the side effects tab for details of these. How Much Does Shred Xtreme Cost? One bottle of Shred Xtreme costs $16.99 from Amazon, which includes free shipping. The bottle contains 60 capsules, which should last a user for 30 days, if taken as directed. Straight away, we had an issue with this supplement because it uses a proprietary blend. We always wonder why the manufacturer isn’t being completely transparent about how much of each ingredient is in there. We believe it is because there isn’t usually enough in there to make it effective. We think, as we have mentioned in the ‘does it work’ supplement, there are some ingredients missing from it that could make it work, such as capsicum and glucomannan. We are also very concerned with the confusion over ingredients. When it comes to anything you put into your body, you need to be absolutely sure it is exactly what it says it is. The fact that some customers have reported having bottles sent out containing totally different ingredients is very worrying and dangerous. There is also next to no information about Innovative Labs, who don’t have a website or social media. If you have an issue, you can’t get in touch with them and you can’t see who you are buying from and what they stand for. Taking this into account, we do not recommend Innovative Labs Shred Xtreme to our readers. 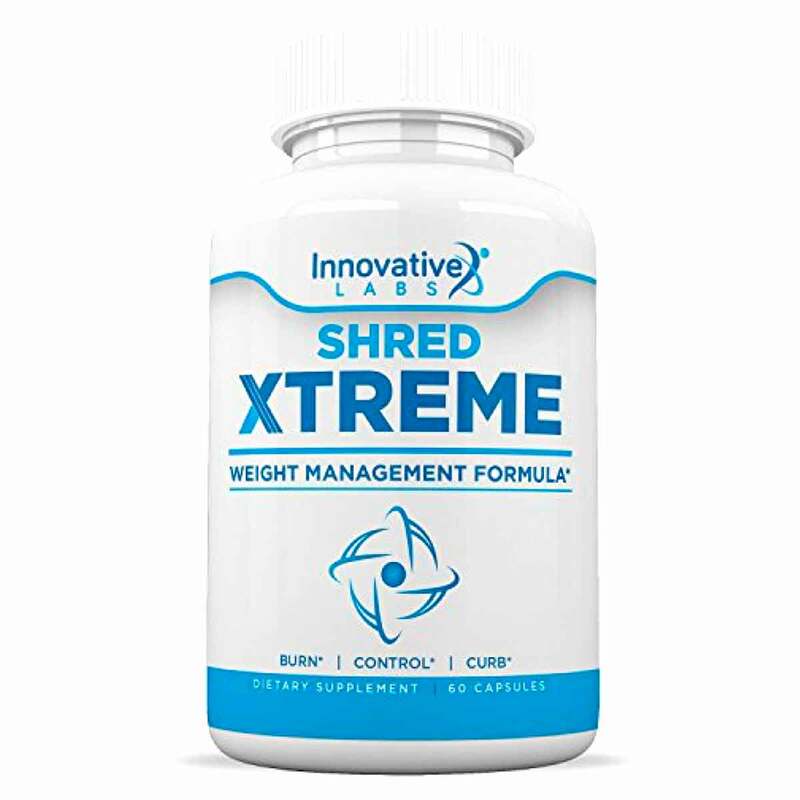 Shred Xtreme is a weight management supplement made by Innovative Labs, and is designed to help users lose weight quickly, alongside diet and exercise. Ever since Dr Oz featured them on one of his shows as the ‘next big thing’ in weight loss back in 2013, raspberry ketones and garcinia cambogia have become increasingly popular in the world of diet pills. However, there is a real lack of scientific proof to support them. Raspberry ketones are, quite obviously, found in raspberries, but it also is a chemical that can be artificially reproduced in a laboratory. Some early studies in rats and in vitro appear to show that it may help to kick-start metabolism and encourage the production of adiponectin. This is a hormone that can help to increase the rate the boy burns fat and reduce appetite. It is, however, important to point out that there has been no evidence to show that it works this way in humans. Garcinia Cambogia is thought to work as a carb blocker. It is high in HCA, which supposedly helps by blocking an enzyme called citrate lyase. This enzyme plays a role in converting the starch and sugars in fat. When it is inhibited, the body cannot use it to produce energy and therefore uses the body’s fat stores. Studies show that any effect is very small. Green coffee bean extract is another popular ingredient found in weight loss supplement. They are coffee beans before they go through the roasting process and are high in chlorogenic acid. This works thermogenically and may help with weight loss to a small extent. We don’t know anything about the company and are unable to find anything online. There is no official website or social media associated with them. It is important to point out that whilst these are the ingredients on the image of the bottle label on Amazon, the description talks about caffeine anhydrous (which is not on the label), and one of the reviews claims that the ingredients are completely different. Innovative Labs are a company who we think are based in the US. We don’t know anything else about them, and they have no official website or social media that we can see. What Does Shred Xtreme Claim To Do? Our special weight management formula is designed to work with your body. Contains all natural ingredients such as green coffee bean, raspberry ketone, and all nature caffeine. We can’t say for definite whether the Innovative Labs Shred Xtreme works or not, because the exact quantities of each ingredient are hidden under a proprietary blend. In our experience, this is because the ingredients are not high enough in quantity to be of any real use. A lot of the ingredients in there appear to have no use in weight loss, or have absolutely no evidence to support them, such as horny goat weed and acai berries. What Are The Ingredients of Shred Xtreme? The exact quantities of each ingredient are unknown. Raspberry Ketones: Raspberry ketones are mostly made synthetically in a laboratory. They have been shown to cause slight weight loss in rats and in vitro trials, but despite being a popular ingredient in weight loss supplements, there are no human trials to back up their efficiency. Garcinia Cambogia Extract (Fruit): This is an Asian fruit known for its sour taste. It is high in Hydroxycitric acid (HCA) and, according to research, this helps weight loss in two ways. For one, the chemicals in HCA prevent a natural digestive enzyme called Alpha Amylase from breaking down the carbohydrates you consume and storing them as fat. It also has a mood-boosting effect, as it helps to build serotonin, which is also known as the ‘happy’ hormone, levels. People are generally less likely to comfort eat when they are happy. Green Coffee Bean Extract (Bean): This will have a mild thermogenic effect. It contains caffeine and chlorogenic acid, which cuts down the amount of glucose produced in the liver, which makes the body has to use fat stored in the body for energy. African Mango Extract (Seed): Research on whether this African fruit has any bearing on weight loss is still very thin on the ground. Whilst it’s flesh is widely eaten, the seeds are thought to hold the powerful ingredients. Most research into this has been sponsored by the weight loss industry, so may be biased. Studies show that it may help to lower cholesterol levels. Acai Berry Extract (Fruit): Acai berries are thought to be a superfood – excellent for overall health. They have a very high antioxidant level. Its impact on weight loss is still not known. Horny Goat Weed Extract (Leaf): This is generally used to treat sexual disorders, such as erectile dysfunction and low libido. We are not entirely sure why this has been added to an appetite suppressing supplement as we can see no evidence to say it helps in any way. L-Arginine: This is often used as a remedy for high blood pressure in those with illnesses such as Type II diabetes. It is an essential amino acid that has been thought to help with exercise performance and muscle growth. However, there is very little evidence to support this theory and because it has a low absorption rate, it is not considered an effective ingredient for a fat burner. Psyllium Husk: This comes from the seeds of an Indian plant called Plantago Ovata. It has natural laxative properties, helping your body have bowel movements regularly, and helping to improve digestive health. Yacon Root Extract: The natural syrup contained in Yacon root may have weight loss benefits. Some of the research has been carried out in animals, but looks promising for humans. Alfalfa Leaf: Alfalfa is a fibrous plant thought to aid digestion. Its uses are varied but none have been proven in a clinical setting. It is not advised to take it for a long period due to the side effects and problems it creates. Symptoms similar to lupus has been experienced by some users and others experience skin reactions and sunlight sensitivity. Does Shred Xtreme Have Any Side Effects? Some Potential side effects of Garcinia Cambogia include headaches, skin rash, upset stomach, abdominal cramps, gas, loss of appetite, fatigue, chest pains, lightheadedness, slowed heartbeat, constipation, and allergic reactions. Horny goat weed may cause upset stomach and dry mouth. In some people, it may result in an irregular heartbeat, low blood pressure, nosebleeds, and mood changes. High doses have been linked to spasms and respiratory failure. We don’t quite know how safe raspberry ketones are, but are wary as it is chemically related to synephrine. It is a stimulant, so may cause jitteriness, high blood pressure, and increased heart rate and palpitations. As with all supplements, check with a doctor or healthcare professional before use if you are under the age of 18, pregnant or breastfeeding, have any existing medical conditions or take any medication, whether it is over the counter, prescription or herbal. Are There Any Customer Reviews For Shred Xtreme? The reviews on Amazon are generally positive. However, one user claimed the ingredient listed on Amazon and the ingredients that it actually contained are completely different, which is a huge red flag. Does Shred Xtreme Offer a Money-Back Guarantee? No, there is no money-back guarantee offered for this supplement. Where Can I Buy Shred Xtreme? 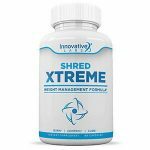 Innovative Labs Shred Xtreme can be bought from Amazon, costing $16.99 for 60 capsules. This should last the user 30 days, if taken as directed. How does Shred Xtreme compare to Phentaslim? The Diet Pills Watchdog does not recommend Shred Xtreme.